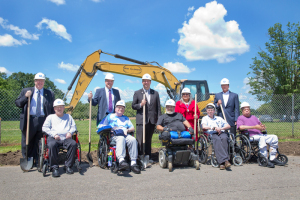 (DANVILLE, Ill.) – Mercy Housing Lakefront, Danville Housing Authority, and the U.S. Department of Veterans Affairs joined with community members and supporters to celebrate the ground breaking of new permanent supportive housing for homeless veterans. The $17.5 million project includes 65 units of affordable and supportive housing for homeless and disabled veterans and their families. 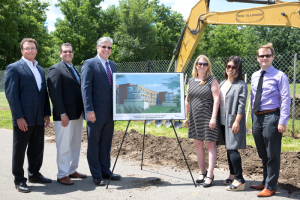 The building will be located on the campus of VA Illiana Health Care System, the regional veterans administration hospital in downtown Danville, Illinois. In addition to safe, permanent, high-quality housing, veterans will have access to supportive services to help improve their quality of life. The project is one of the first in the nation to provide affordable housing on a VA medical center campus. As a result, chronically homeless veterans will have better access to health and social services. The 65 units include 44 one-bedroom, 18 two-bedroom, and three three-bedroom apartments, all of which will be reserved for at-risk and homeless veterans and their families. Rent will be subsidized through vouchers provided by the U.S. Department of Housing and Urban Development. The building also will have community rooms, computer rooms, a fitness center, and office space for case managers. Construction will be completed in summer 2016. The application process for leases will begin in spring 2016. The U.S. Department of Housing and Urban Development estimates that 49,933 veterans are homeless on any given night. A lack of affordable housing, livable wage jobs, access to health care all contribute to the problem. Permanent, safe, community-based supportive housing is widely recognized as the most effective, efficient means to combat chronic homelessness among veterans and other populations. Permanent supportive housing helps create a stable environment where individuals and families can work through challenges with the end goal of achieve self-sufficiency. The 74,100 square-foot development is designed to foster the accessible and visible connection between the residents and the greater Danville community. The overall development takes advantage of the rolling topography and mature landscape, creating and capturing views and daylight for the residents. The articulation and materiality of the new development will provide a fresh, dynamic and inviting appearance for the campus while complementing the existing architecture. Chicago-based Perkins-Eastman serves as principal architect for the project. Forsyth, Illinois-based Horve Construction is the general contractor. Supportive services will be provided by Danville-based Crosspoint Human Services, a regional provider of behavior health and homelessness prevention services. Since the project is located on the VA Illiana Health System campus, residents will have ready access to Veterans Administration health and social services. In addition, residents will be able to take advantage of vocational training and employment services at the Danville Area Community College, which is co-located on the campus. The project enjoys financing from a variety of public, private and non-profit organizations, including the Illinois Housing Development Authority (IHDA), Federal Home Loan Bank, US Bank, LISC, First Midwest Bank, and National Equity Fund (NEF). Citi Community Development and the MetLife Foundation provided funding for construction start-up costs through Bring Them HOMES, a veterans housing initiative created by the National Equity Fund. NEF is an affiliate of Local Initiatives Support Corporation (LISC). 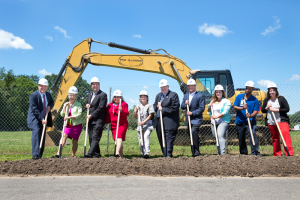 “Extraordinary things happen when you have great partners and today’s groundbreaking for the Danville Veterans Housing Project is proof of that belief,” commented Joe Hagan, president and CEO of National Equity Fund, LIHTC syndicator for the development. In addition, The Home Depot Foundation generously provided a $500,000 grant for the project. Since 2011, The Home Depot Foundation has invested more than $85 million to provide safe housing to veterans, and along with the help of Team Depot volunteers, has transformed more than 17,000 homes for veterans.